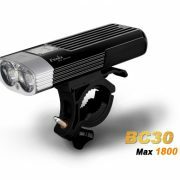 The BC30R is a Micro USB rechargeable bicycle light features digital display screen for confidence-inspiring readings. 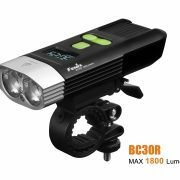 It is fitted with two Cree XM-L2 U2 neutral white LED’s, and emits a max output of 1800 lumens with featured dual distance beam system. OLED display panel, which displays the remaining runtime at the current output level, and the battery percentage clearly, as riders need not only comfortable lighting, but also need to know the remaining runtime, whether during mountain biking or urban riding.A compact body with built-in rechargeable batteries,upgraded quick-release fitment, newly designed remote pressure switch and full-metal housing for better dissipation allow this versatile light to illuminate your trails confidently. 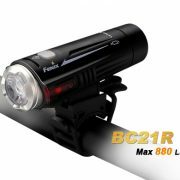 Fenix BC21R, an integrated yet versatile rechargeable bike light, delivers max 880-lumen neutral white light. 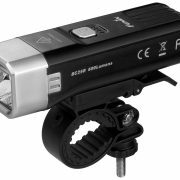 The soundly reasonable four output modes plus Flash enrich the cycling activities and side red light ensures the riding safety. Moreover, quick-release bike mount makes it easier to mount or dismount the light. 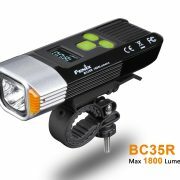 The feasibility to change battery gives the access to command runtime and prolong the lifespan of the bike light. This well-designed bike light goes anywhere for any activity, it commits to diversify your bike lifestyle and enhance your every ride such as road racing, bicycle riding and urban commuting.